Po Chai Pills is a very common medicine in most of the Chinese household since many decades ago. We used to and still popping a bottle or 2 of Po Chai Pills into our mouth to treat stomach disorder. Believe it or not, I have been carrying a bottle in my bag for emergency used, if it is true that it contents dangerous substances that's mean I am carrying poison in my bag all this while, gosh...!!! 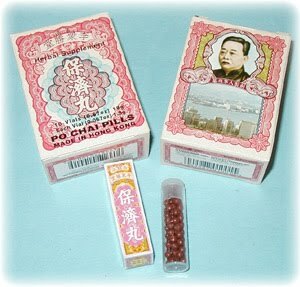 One of the most commonly used Chinese herbal pills in Hong Kong, Singapore and Malaysia called, "Po Chai" (see images below) have been banned in Singapore. They are also being recalled in Hong Kong. In addition to two dangerous chemicals (phenolphthalein and sibutramine) found by the Singapore Govt., it's also discovered that mercury is a component used in the manufacture of the pills! Mercury can cause serious brain damage: http://en.wikipedia.org/wiki/Minamata_disease Hong Kong Pulls Po Chai Pills because of Health Risks, Morning Post Says 2010-03-25 01:49:27.289 GMT By Frederik Balfour March 25 (Bloomberg) - Hong Kong 's Department of Health has instructed traditional Chinese medicine maker Li Chung Shing Tong (Holdings) to recall Po Chai pills after they were found to contain banned substances in Singapore, the South China Morning Post said. The pills, popular among sufferers from digestion problems, were found to contain phenolphthalein and sibutramine, substances that can lead to serious side effects, according to a department spokesman, the newspaper said. refer here for further information. For me i prefer take Hundred Plus when diarrhoea rather than take medicine.